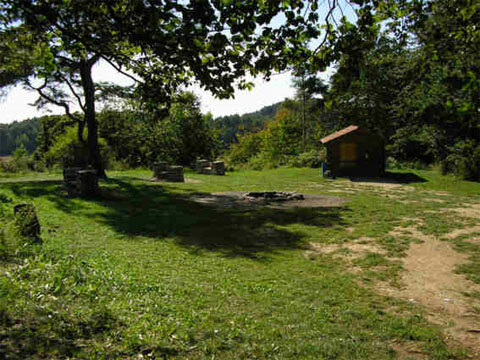 The barbeque area located at the "Herz-Jesu-Berg" has been built by the City of Velburg. Everybody can use the barbeque facility after payment of a deposit. Persons without a permanent address of residency are not permitted to enter the area. The use includes the right to utilize the sanitary facility and the fire-pit as well. It is prohibited to conduct a trade to or from the barbeque facility. Open fire is only permitted at the fire place. The name of the person(s) responsible for public safety and order needs to be provided to the City of Velburg. Sporty and considerate behaviour is a natural obligation. The sanitary facility has to be kept in clean condition. The key is available upon payment of the deposit and has to be returned to the City of Velburg or to an authorized employee after departure of barbeque area. All trash (except bulk trash) has to be placed into trash cans provided and has to be emptied in accordance with the law. It is prohibited to dispose of garbage outside of te barbeque area. The deposit in the amount of 50 € has to be paid to the City of Velburg or to an authorized employee prior to using the facility. You will be charged for any damages or contamination of the facility. The costs will be deducted from the deposit. If the charges exceed the amount of the deposit the responsible person will be liable to reimburse the City of Velburg accordingly. Any damages that are visible upon arrival, prior to the use of facility need to be reported to the City of Velburg immidiately. A user fee in the amount of 20 € per day for local residents and 30 € for non-local residents is payable to the City of Velburg or an authorized person. For each additional day, 50 % of the appropriate fees will be charged.